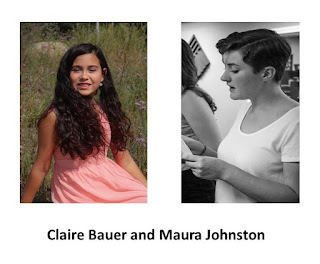 Claire Bauer, age 15 of Franklin, and Maura Johnston, age 16 of Norfolk, are both students of voice at Encore Music Academy and Recording Studios. Each young woman has recently been awarded the National Gold Medal of Excellence for 2018 by the Royal Conservatory of Music: Bauer for Level 6 Voice, and Johnston for Level 2 Voice. The Royal Conservatory of Music awards the National Gold Medal of Excellence to the student who has achieved the highest score in the country within their specific skill level for each instrument. For the assessments, students are graded on proficiency in the following areas: Performance; technical requirements; aural skills; rhythm; and, sight-reading ability. Johnston, who has been studying voice for three years and piano for one year under the expert guidance of Rebecca Abalutzk, also performs and records albums with the recording ensemble, The Encore EnHarmonix. Abalutzk had this to say about Johnston's tremendous achievement: "I am both extremely proud and fortunate to work with such a driven young woman. She is the type of student who reminds me why I became a teacher in the first place". Claire Bauer, under the guidance of her vocal instructor, Lisa Ostrow, (who has guided students to national gold medals three times previously), began her studies in voice using the curriculum of the RCM right from the start. Upon hearing of her award, Bauer mused, "Well, I think getting this award has a lot to do with the person who drives me everywhere," and then she gave her mom the biggest smile ever. Says Ostrow, "Students like Claire are every teacher's dream. They challenge us to be the very best that we can be, so that they can reach their full potential." "The accomplishments of both of these young women is simply extraordinary. Having scored higher than any other student in the country on their respective vocal assessments, a National Gold Medal is a true testament to the dedication each brings to her music studies, the level of support each receives from her family, her innate talent, and her tremendous desire to achieve. And, best of all, Claire and Maura are an absolute joy to work with - fun and funny, talented, and incredibly sweet. We are very proud of both of them, as we are of all our students." An added bonus to this remarkable achievement is that both Johnston and Bauer will be heading to Carnegie Hall in February to perform, as a result of having each won her National Gold Medal.